Pioneers in the industry, we offer biomedical waste collection bags and biomedical waste bag from India. We are an environmentally responsible organization manufacturing a wide range of Biomedical Waste Collection Bags. To destroy medical waste is important as it is highly contagious and can spread harmful infections. Our range of biomedical waste collection bags is Eco-friendly and is the best option for disposing of any type organic waste. With enriched industrial experience and knowledge, we are providing an excellent range of Biomedical Waste Bag. 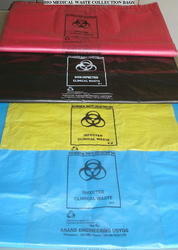 Looking for Biomedical Waste Bags ?